Matera is the most ancient living city in the world, an extraordinary place where the human history can be perceived in its uninterrupted continuity best than everywhere: the stable human presence in this territory began 12.000 years ago, favoured by the morphology of the environment characterized by thousands of natural caves that allowed men and women to be hosted and protected. The city is famous for its ancient urban centre, the Sassi neighbourhood, houses dug into the calcareous rock. Today many people are still living in the same houses of their ancestors of 9,000 years ago. Matera was the first site in South Italy to be declared “ Unesco World Heritage”, in 1993. 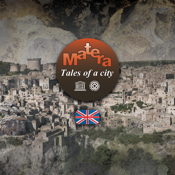 “Matera: tales of a city” is not a descriptive traditional guide: it does not inspect monuments mentioning who made them and when. On the contrary it tells the incredible stories that took place in those ancient sites, real fragments of life, myths, events, characters, memories. You can use it before going to Matera or while you are visiting the real places. Several 3D reconstructions show the evolution of Matera and its landscape through the time, in eight different ages: the emersion of lands from the sea more than two million years ago, the terrain and “gravina” formation, the birth of the first neolithic entrenched settlements (5000-4000 b.C. ), the diffusion of the life in the caves, the construction of the “built” and fortified space in the Middle Ages, the expansion from the Civitas to Sassi suburbs, from Sassi to the planar area where the modern and contemporary city developed. A lot of people have helped with this project: they have narrated the places of the city and of the territory on the basis of their own memories and encounters, their own visions, discoveries and life experiences. Also many well-known artists gave their contribution, bringing to Matera their art. Some data about the application: 56 movies, 30 slide-show, 8 chronological phases reconstructed in 3D, a VR environment. The project, realized by CNR ITABC, has been supported by the Regional Promotion Agency (APT) and the Basilicata Regional Government’s Department of Manufacturing/Production Activities.